Place pita bread rounds on ungreased cookie sheet, outer surface up. Broil 3 to 4 inches from heat for 2 to 3 minutes or until lightly browned, turning once. Brush bread rounds evenly with oil. Sprinkle evenly with Parmesan cheese. Broil an additional 1 to 2 minutes or until lightly browned and toasted. Cut bread rounds into 1 1/2x1/2-inch strips. Cool 5 minutes or until completely cooled. Meanwhile, in very large bowl, combine salad greens, tomatoes, cucumber, onion rings, olives and feta cheese; toss gently. Just before serving, pour dressing over salad. Add pita bread strips; toss gently. Kalamata olives are purple-black Greek olives with a slender oval shape and rich flavor. Each olive is slit to allow a wine vinegar marinade to fully penetrate the flesh. Kalamata olives are packed with olive oil or vinegar in jars. Ripe olives can be used in place of the kalamata olives in this salad. Prepare pocket bread strips up to 12 hours ahead; store in a plastic bag. 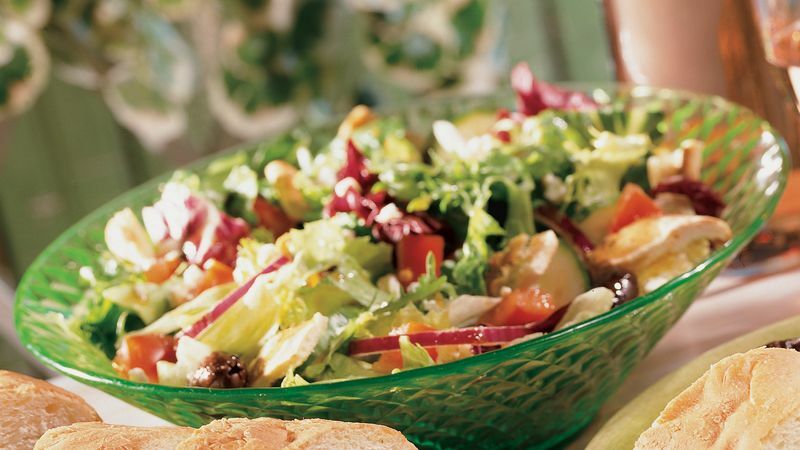 Combine the salad blend, vegetables, olives and cheese in a serving bowl. Cover the salad with a damp paper towel and plastic wrap; refrigerate up to 12 hours. Just before serving, toss the salad with dressing and bread strips.